Couldn’t resist. From the lowly to the elite. A typical roadside cemetery where you can hardly tell the markers from the natural rocks and stones ... and the so-called Royal Tombs at the ancient carved city of Petra in the Hashemite Kingdom of Jordan. The nomadic Bedouins seem to be a lower class because they resist royal offers of housing and education? Because they continue to live and dress and tend their animals as they did 2,000 years ago? Genealogy is normally not far from my mind, but parts of this blog will still feature bits of Brenda’s inexplicable love for eastern and southern Mediterranean locations (and camels). Jordan in 2007 was a revelation in archaeology, biblical sites, Middle East history, and especially Arab culture. The genealogically-related pursuit of interesting or offbeat cemeteries is relentless and demanding but someone has to do it. Recently I found myself in Paris to do just that—enjoy a site I’d regretfully missed on a number of previous visits. 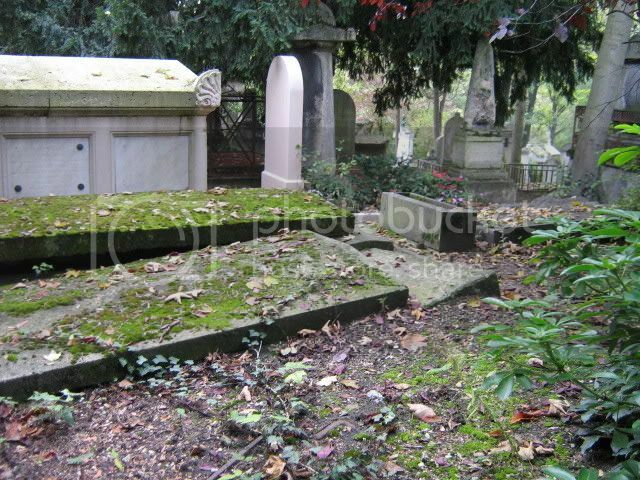 Père Lachaise cemetery is not on everyone’s top ten Parisian landmarks. But it does hold hallowed ground (pun intended) among cemetery connaisseurs. The old monuments are family dedicated forever. Note the concession à perpétuité. Navigating over 100 acres of hilly territory amidst small gaggles of gaping tourists and the occasional funeral procession or maintenance vehicle was a challenge. Isadora Duncan eluded me, even with my selection of drooping site maps (uh oh, I’m looking like a tourist myself). Maybe she is just there by the crematorium building which was blocked off for restoration. And where oh where did Jane Avril go? Back and forth, up and down, weaving criss-cross between the markers on that particularly difficult hillside, I couldn’t find her. While Toulouse-Lautrec is not there, his friend Jane is, without visible epitaph. 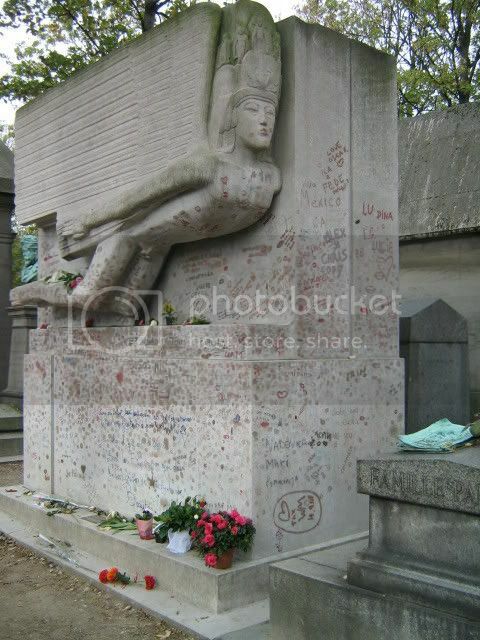 We all know Jim Morrison has his fans, but Oscar Wilde was a clear favourite. 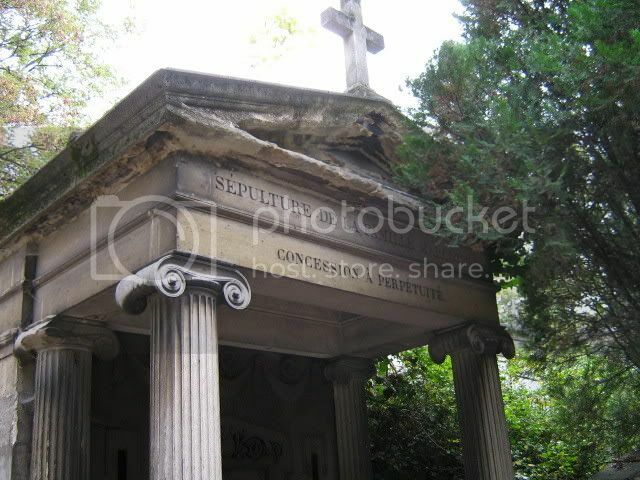 Admonitions to respect the dignity of the deceased had no effect on this lipstick-smeared, rather ugly memorial. Victor Hugo and Chopin were accorded more appropriate homage with many flowers. Simone Signoret and Yves Montand. Modigliani, Proust, Balzac, Rothschilds. Pause for Molière, remembering Le Misanthrope in French 401! 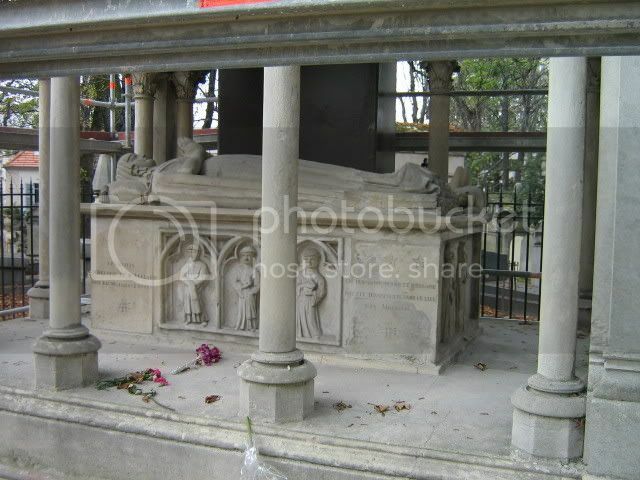 Héloise lies beside her Abélard for eternity now, their mediaeval remains having been reinterred here. With all the activity going on within and without the gates, I feel that concession à perpétuité is assured. My techie CDM says click on the photos to enlarge them. You probably already knew that. Magic.